I continue to coordinate a series of Design Challenges for the Energy Innovation Center (EIC). The program includes high school students from the Parkway West consortium of schools. 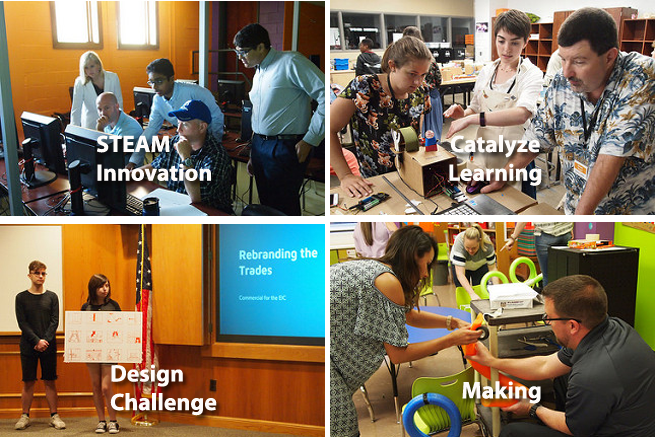 This spring student consulting teams completed their work on two Design Challenges. One Design Challenge asked the student consultants to find new ways to increase the LEED status for the Energy Innovation Center. The other Design Challenge focused on “Rebranding Careers.” For the fall three new student teams will work on an extension of “Rebranding Careers” and another team of three schools will work on a Design Challenge that will focus on a Lighting Plan for the Bedford Avenue entrance to the Energy Innovation Center. I continue to work with the South Fayette School District on the STEAM Innovation Summer Institute. This year the professional development activities happened from June 18-21 with most of the activities on the South Fayette campus, but with one session on Sustainabity/Project-based Learning at Chatham’s Eden Hall campus. Over 120 educators joined this year’s gathering with strong contingents from outside Pennsylvania – Kentucky, Virginia, and West Virginia. I worked with a team from Birdbrain Technologies and CMU’s CREATE Lab to develop Catalyze Learning, a user conference in Pittsburgh that occurred from July 23-25. The Summer Institute brought folks from across the USA and South Korea. All of the participants received a new premium Hummingbird Kit that was one of the products that won Best of Show at the 2018 ISTE Conference in June. The new Hummingbird taps into the power of Micro:Bit. For the first time Hummingbirds will be untethered and will be able to communicate with each other. The new Hummingbird will be available in December for purchase.